The rand (ZAR) is the currency of South Africa. It takes its name from the Witwatersrand where Johannesburg was created. Despite the big international fuss favorable to Mandela, during the last decades the country has not been targeting on the right direction. It is also true that it depends on the commodity markets and the World slowing down didn't help at all. 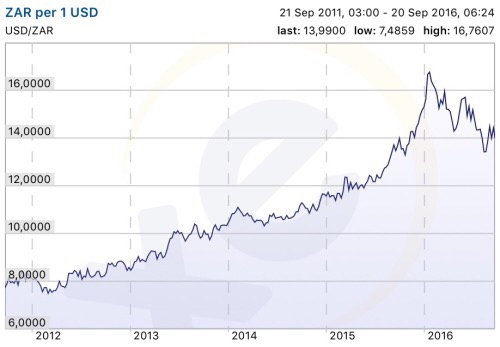 As you can see on the chart above, the USD has been going up for the last five years until debasing the rand to half of its value. However, this year the rand has strengthened against the dollar to exactly the first Fibonacci stop. If we had to guess, the USD should now continue the upward movement for the next years. If true, today's price could be a good entry point.